The Fred Schmidt Railroad Museum is now open in the former freight room of the depot. The museum is named in honor of one of the founders of the Abilene & Smoky Valley Railroad. 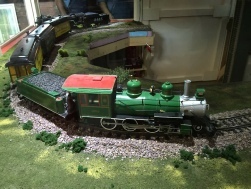 Please visit the museum and enjoy the exhibits of railroad memorabilia and model trains. 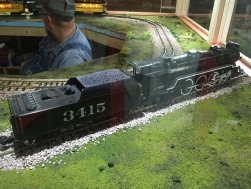 The G scale model trains were donated to the museum by the family of Chuck Heroneme, in his memory. The museum is open any time the depot is open for business. Growing up in Junction City, KS, Fred developed interests in music, Kansas history, and steam engines. After receiving B.A., M.A., And PhD degrees in music education, Fred, at one point in his career, taught choral music at Ft. Lewis College in Durango, CO. During the summers in Durango, Fred worked as a fireman shoveling coal on the steam locomotives on the Durango & Silverton Narrow Gauge Railroad. After moving to Abilene in 1974, Fred worked in sales and repair of musical instruments for Glenn’s Music in Manhattan and later for himself. Active in the Dickinson County Historical Society, Fred and Joe Minick restored the steam engine for the Parker Steam Carousel where it still operates at the Heritage Center in Abilene. The two friends later restored the steam engine from the 1856 steamboat Arabia that is now on display at the Arabia Steamboat Museum in Kansas City, MO. In 1993 Fred and Joe formed the Abilene & Smoky Valley Railroad which has been running continuously since that time. In 2001 the railroad obtained the former ATSF 3415 steam locomotive that had sat for years in Eisenhower park in Abilene. After 8 years of restoring the locomotive to operating condition it made it’s first run for the public on the Abilene & Smoky Valley Railroad on Memorial Day in 2009. Possessed of a wide-roving and inquiring intellect, Fred’s enduring interest in all aspects of history, especially American and Civil War, antique furniture and machines, transportation on land, sea and air, furnished years of reading and exploring. He accumulated books, artifacts and understanding consistently until his death. Some of those artifacts can now be found in the Fred Schmidt Railroad Museum in the historic former Rock Island Depot at the Abilene & Smoky Valley Railroad which is adjacent to Old Abilene Town and the Eisenhower Presidential Library and Museum.